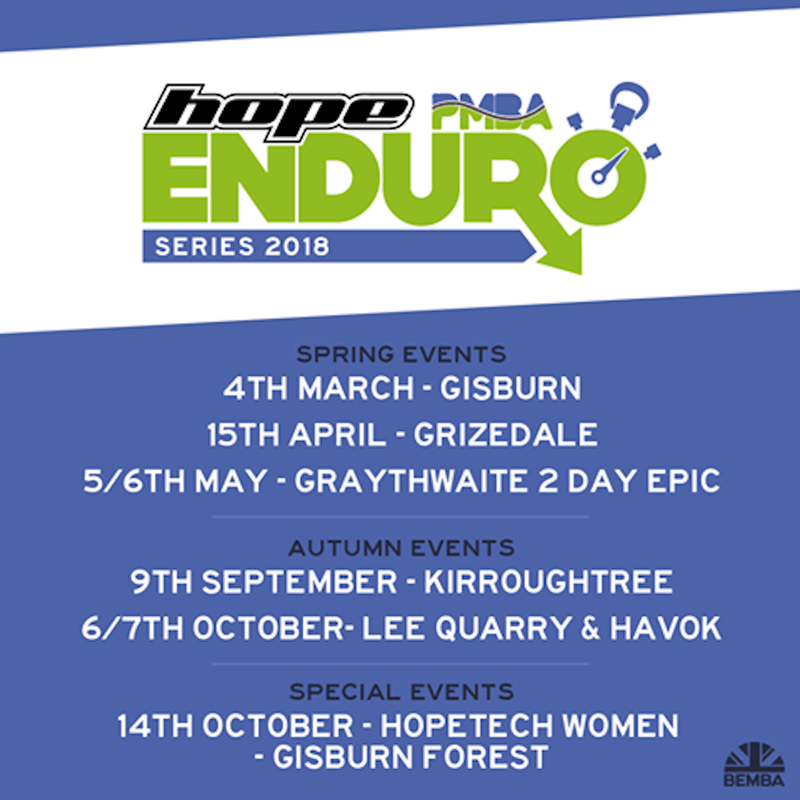 The opening round of the 2019 Hope PMBA Enduro Series headed to a very sunny Gisburn Forest to see who had been training over the winter. Hope Factory Racing’s Ian Austermuhle took the fastest time of the day and the masters win at round one of the 2019 Hope PMBA Enduro Series, showing the young uns how to do it. 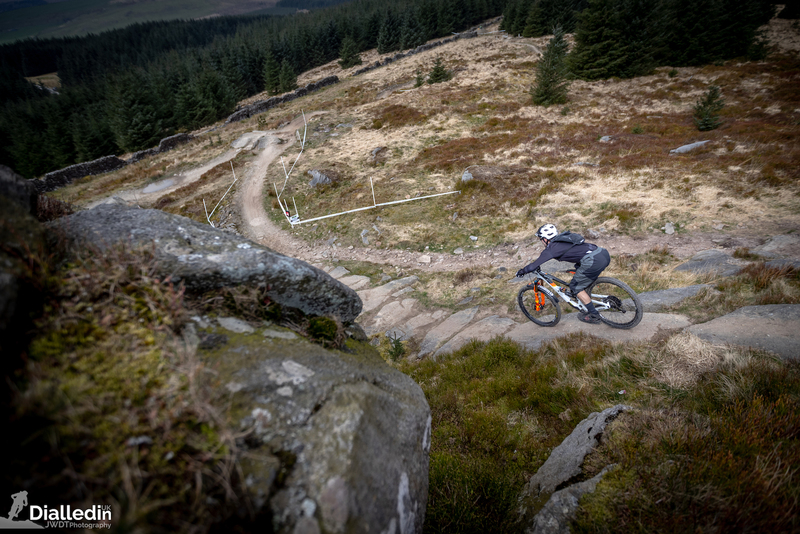 Gisburn Forest offered five stages with a mix of trail centre and off-piste stages, all under a blazing April sun. Full results can be found on Roots and Rain here. Last season the PMBA race series was widely acclaimed as a massive success. This year Kev Duckworth and his team have every intention of delivering another epic series, and are already making huge strides towards that! 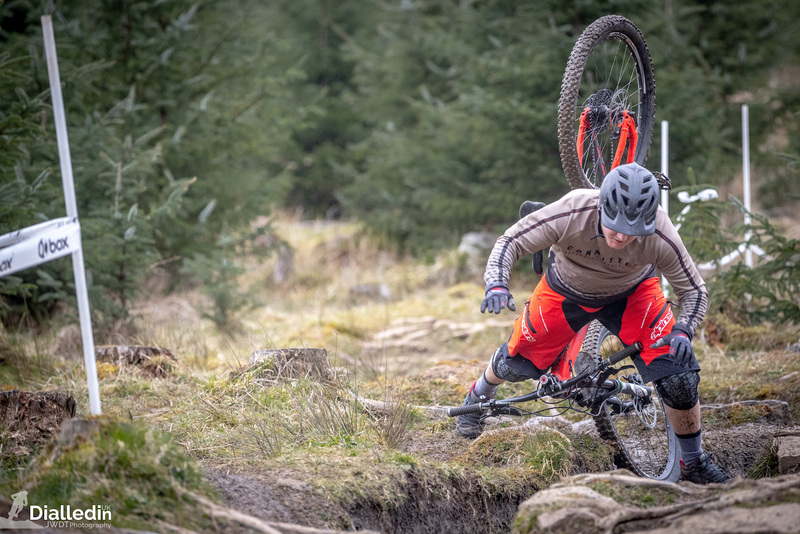 Last weekend saw the launch of the 2019 PMBA race series at Gisburn forest…This round sold out in a staggering 55 minutes. Last year it took 7 hours to sell out. Clearly the Beast from the East and the unfortunate cancellation of last year did not put the riders off this year….and what a race it was!The weekend saw the one of the most successful Gisburn PMBA Enduro weekends ever, with the record numbers of riders signed up and the second largest number of riders finishing. Kev Duckworth (the organiser) says he could have sold over 500 places this year, but due to parking and daylight hours, there has to be a cap on numbers. 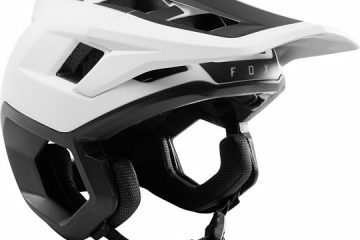 This is testament to the growing reputation of the Hope PMBA Enduro Series and is reflected in the increasing numbers of series sponsors and prizes! 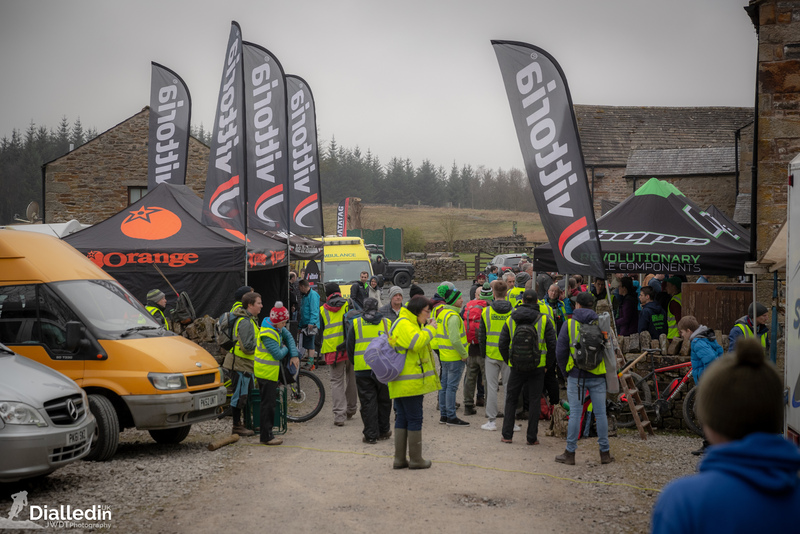 There was a real buzz in the event village as riders queued for sign on, a sense of excitement and anticipation brought on by a seemingly long winter break. This year Kev has opted to skip the usual opener of the day/night race, choosing instead to devote his time to ensuring that the PMBA summer series is bigger and better than ever.Gisburn forest is part of a network of Forestry England’s super 6 MTB trail centres, the others being Grizedale, Hamsterley, Chopwell, Whinlatter and Kielder. 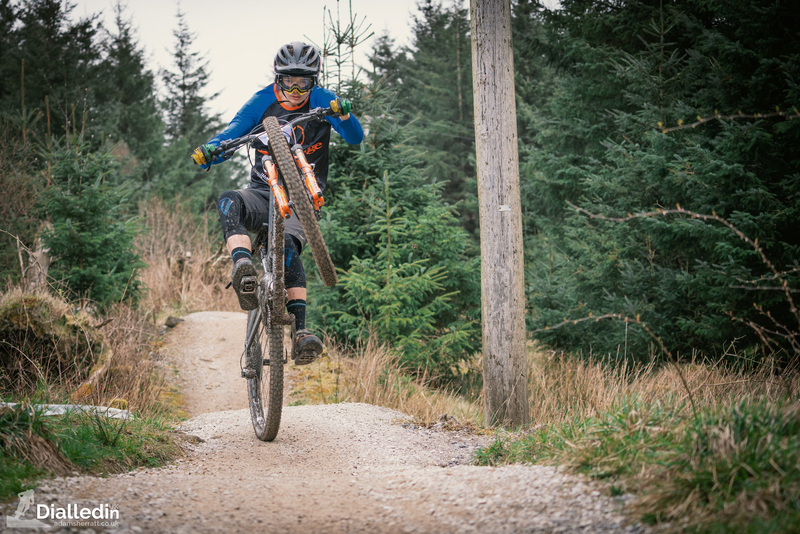 Gisburn Forest may not be the highest elevation in the PMBA races, but that doesn’t stop Kev and his team putting on some great stages, using a mixture of trail centre and fresh lines. You do however hear some of the racers saying fitness is key for a good result here due to the hard on the pedals stages. 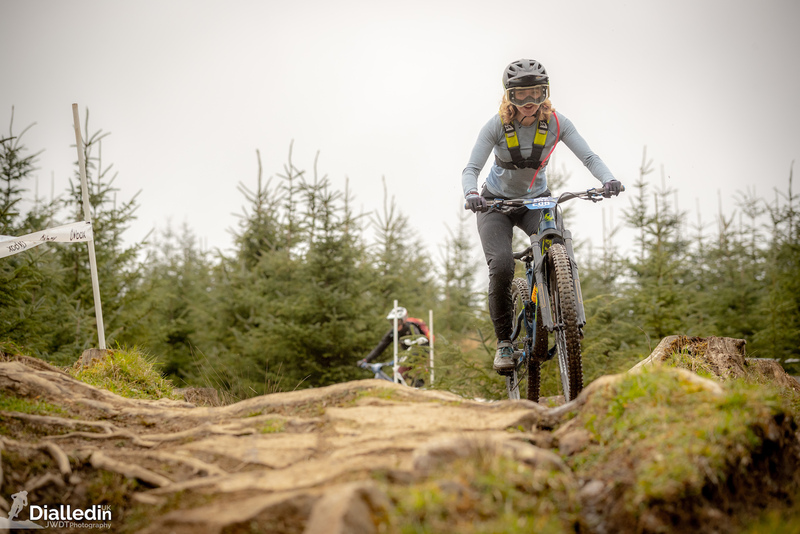 Gisburn is traditionally pitched as the series opener, an introduction to racing for some and a great way to test skills and raise fitness for other. The top of the first stage, you could feel the tension, the nerves and pre race jitters. For many, the first race of the season.This race consisted of 5 stages across the top half of the forest’s figure 8 loop. Stage 1 was the Whelpstone Crag rock drop and into Long Way Down. A nice opener to the event to get the legs pumping. Stage 2 was the very popular trail centre trail Hully Gully, with it’s huge sweeping berms and braking bumps to contend with. Offering epic views over the forest tops as it drops into the steep berms, this stage is always a favourite. 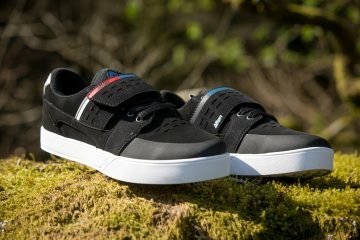 Stage 3 was Enduro Roots. Starting high in the forest and within the trees, this was more natural initially and a super fast straightline hitting rocky and muddy patches, then over the road and dropping into a more technical rooty section, that caught one or two riders out. 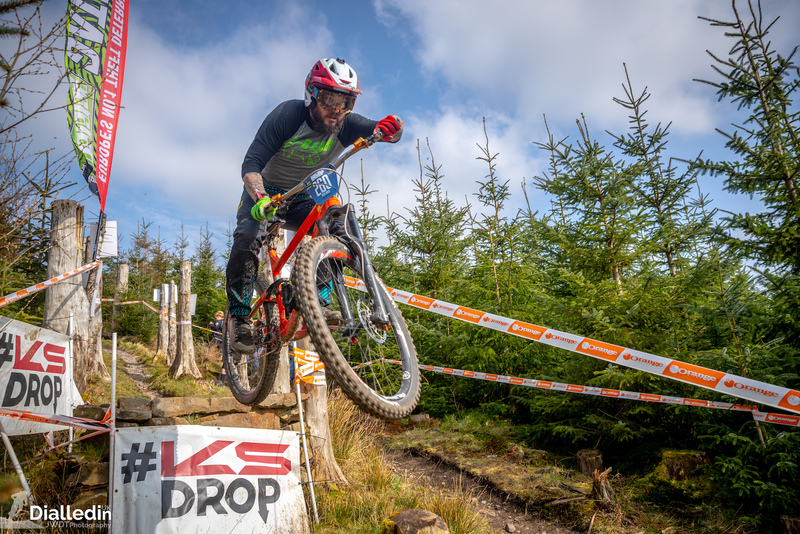 Stage 4 was the ever popular DH line and a chance to style it up at the #KSdrop. Drops, jumps and some more natural singletrack trail in the bottom half. 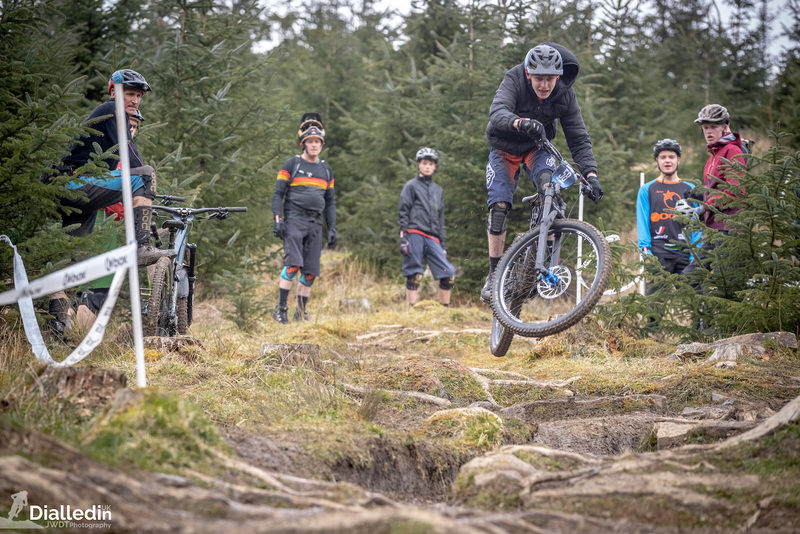 The final stage was the Hope line, a purpose built trail centre line with excellent jumps, drops and fast berms, further chances to style it up for the photographers about the forest. This year stage 5 ran down a recently built trail centre line. It’s great to see these lines continually evolving thanks to the hard work of the trail builders. Finally, through the mossy jungle section and into the finish at “Vittoria Station”! To summarise the results is lengthy as the PMBA had 12 categories for this race, including individual prizes for the overall fastest man and woman of the day. Overall the fastest male across the 5 stages of the day went to Ian Austermuhle (30-39) in a stunning 9:50.13, second fastest and hot on Ian’s tail went to Tom Wilson (U21) in 9:53.90 and third fastest went to Jonathan Weaver (21-29) in 9:55.47. That’s an astonishingly close fought battle between the top three riders! A huge shout out to Davy Ledgerwood (40-49) in the vets category for breaking into the top ten fastest times of the day in 10:23.48, keep those young uns on their toes Davy! The fastest woman overall of the day went to K.J. Sharp (21-34) in 11:24.20, second fastest Toni Fryer (21-34) in 11:53.55 and third went to Abigale Lawton in 12:14.06. It was great to see Rose Tempest (U16) and Melissa Pearson (+35) making it comfortably into the top ten fastest women of the day. It’s great to see the PMBA still attracting good numbers of women to the race scene. 30 in total for this race and pretty much 10% of the racers. For a full run down of the results you can head over to roots and rain or sportident to see how you faired against the top riders. Some of you may have noticed the removal of the “Elite” category. I caught up with Kev to discuss this. One of the hurdles the BNES organisers has had to overcome to put on a national series was category standardisation. We settled on the 6 EWS cats, then added master men (30+), grand vet men 50+ and U18 men. 6 mens cats and 3 women’s. 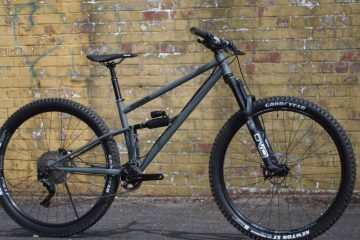 There’s no elite at EWS. PMBA kept a U16 women, u15 men and hardtail to give us 12 categories. It wasn’t a hard decision, we rarely got 10 elites, over the past years the Elite series winner has been a U21, master and even a Vet. The 2019 season has certainly kicked off in style, with record numbers, sensational racing and smiles all round. Next up for the PMBA is a huge weekender of an event on the Bank Holiday weekend. 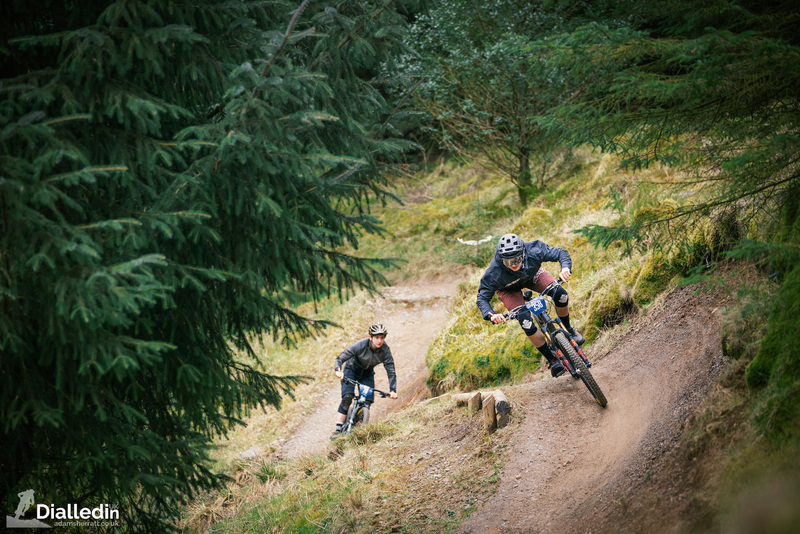 Graythwaite in the epic Lake District is a private estate where it’s literally fresh built 100% mega trails. Only available to ride during this race it’s one not to be missed. 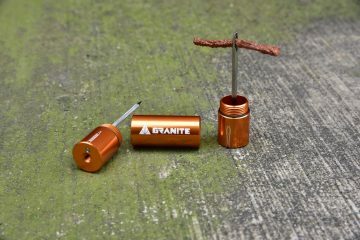 Graythwaite is also the second round of the new BEMBA National Enduro Series (BNES) and DialledinUK will be covering Graythwaite and will also be at Afan/Wales this weekend for R1 of the BNES put on by WGES. 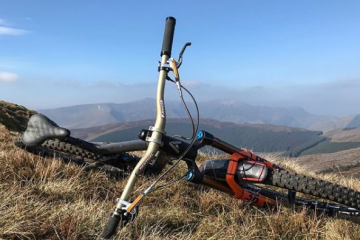 The Graythwaite round is now full, but I’m told there are a select few places reserved for international riders if you are looking for EWS qualifiers. This race report and photos brought to you by DialledinUK. We hope to see many of you at Afan this upcoming weekend. For more images please head over to RootsandRain here. You can read more about the PMBA here on their homepage.